A good coach knows that a team's success always begins with the players. Their abilities, both realized and potential, are the raw material from which the coach molds a successful team. Every coach would love to have a team comprised of equally talented superstars—players able and willing to do it all. But that’s not how it works. At all levels of play, the reality is that each coach must put together a team from individuals who have different strengths and weaknesses. So how does a coach go about this task? A coach needs to find players who can play the team roles necessary for the team to succeed. These roles can be viewed from the perspective of playing a certain position (point guard, quarterback, pitcher, etc.) or meeting a team’s functional need (scorer, defender, ball-handler, etc.). With the right mix of players (ones who can play the required team roles well), a team can successfully compete—even against teams comprised of superior individual athletes. In more competitive play, a team's "chemistry" often makes the difference between winning and losing. Roles are also important in equal-participation youth programs. At this level of play, team roles help provide beginners with an opportunity to find meaningful success. For instance, a young basketball player may initially have a limited role—setting screens, making good passes, and playing solid defense. But when a screen is set that leads to a teammate's layup, this player knows that he or she has made an authentic contribution to the team's success. 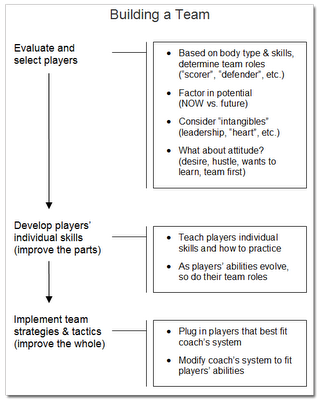 In evaluating prospective players, and the possible team roles they can play, a coach considers a variety of player attributes. Each player presents an observable body type, athletic quality, and set of sports skills. Athleticism and body type are often invaluable qualities necessary to a team's success (and ones that can't be taught). Similarly, excellent sports skills are important. Less obvious is a young athlete’s development potential and other more intangible attributes. Although coaches need to have players who can immediately perform well, coaches are also interested in young athletes who may develop into exceptional players. For example, having just gone through a growth spurt, a young boy or girl may play a sport in an awkward, less-coordinated manner. But to a perceptive eye, the player’s movements and skills also demonstrate a certain grace that suggests the player will soon “grow” into his or her body. A coach is also interested in players who demonstrate leadership, perseverance, a competitive nature, and other less tangible traits. These coupled with other valuable attributes such as a player’s attitude, willingness to prepare, and attention to detail all factor into a coach’s player evaluation. Once a coach has selected the team’s players, he continues to build the team by helping players develop both their individual and team skills. The coach should focus on laying a solid foundation, one that is beneficial to the team and players in the long run. The coach's instruction should help players understand how the simple fundamentals connect to more advanced skills and how this, in turn, leads to both individual and team success. The coach should build connections. Start slow,and finish strong. 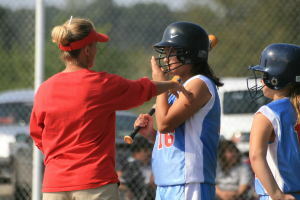 As the players’ abilities improve, the coach should consider whether their roles are still appropriate. A player's team role can evolve—even within the current season. Finally, a coach implements his or her team strategies and tactics—plugging in players that best fit his or her system while also modifying the system to better fit the players’ unique set of abilities. Which players can fill the essential team roles (e.g., "scorer") and who are best suited to play the secondary, more supportive roles? Do individual players, though lacking certain skills, somehow contribute an important quality to the team's overall play? Though raw, does a young player demonstrate potential that will benefit the team down the road? 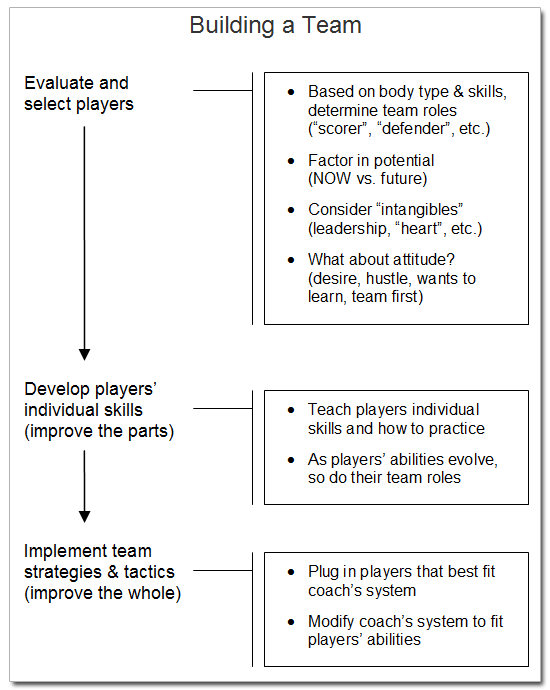 From these questions and others, try to understand how unique player qualities, individual development, player combinations, and well-matched tactics all represent unique pieces in the puzzle that is team success.